Remembrance Weekend: Those who lost loved ones during the past year are remembered in a special way at all our Masses this weekend. Remembrance Weekend is an opportunity to give thanks for the wonderful gift of family, kind neighbors and friendship. All of us are shaped and influenced by what has happened in the past. That is why today and during November we remember and pray for those who have died and acknowledge their influence in our lives. 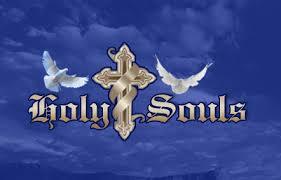 The Novena of Masses for the Holy Souls continues until Monday 10th Nov. Masses each day at 10am & 6pm If you wish your loved ones to be remembered place their names at box at Altar rails. Lists available at back of Church. Gather as a family and make out the list of your loved ones who have died. Some of the children have remembered family members, they have written their names on little crosses that are over at the Remembrance Garden. We all love to be remembered but if we wish to be remembered one day we have a duty now to remember. New Irish Catechism for Adults. Sr. Karen of the Pastoral Development Office will present three sessions on different chapters of the catechism on Tuesdays 4th, 11th and 18th November in the Pastoral Office, Ballyphehane from 10.30am to 11.30 am, starting with coffee. Documentation provided. A Thought: It is difficult to understand death or make sense of the loss of a loved one. Death is not an end, only a beginning. We trust, hope and pray that all who have died are at peace and happy. Today and throughout this month of November we remember them in a special way. Lord, we miss our loved ones, words fail to express the sadness we feel, particularly when our loss is recent. We trust and believe that they are now in a loving relationship with you. May all our loved ones who have died rest in peace.